Complete with plastic sleeve and in excellent condition. In excellent MNH condition as Issued with original sleeve. GB Presentation Pack. Low Value Definitive. Scotland. Complete with plastic sleeve. In very good condition. 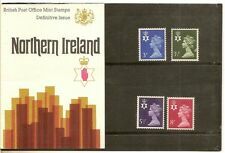 Scotland, Wales & Northern Ireland regional Definitives. Machins including Higher Values. Make Supersized seem small. LOW START GOOD LUCK. SEE MY OTHER LOTS. IF OVER £20 SENT INTERNATIONal SIGNED FOR FROM £7.50 UK FROM £2 FOR £20 AND OVER SENT RECORDED. The photos show the actual item for sale. # 37 2nd 1st. # 21 15p 20p 29p 34p 37p. # 36 Wales, Scotland & Northern Ireland 20p 26p 37p 63p. # 30 19p 25p 29p 36p 38p 41p. GB presentation packs 1981 to 2000 period x 17 different all definitive packs. 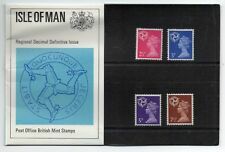 GB 1983 Wales Regional Definitives Presentation Pack No. 3 VGC stamps. Dispatched with Royal Mail 2nd Class Letter. 1/2p - 75p MNH MNH. This gives details of the London 2012 Emblem which is a quadrennial design. Issue Date: 5 January 2012.